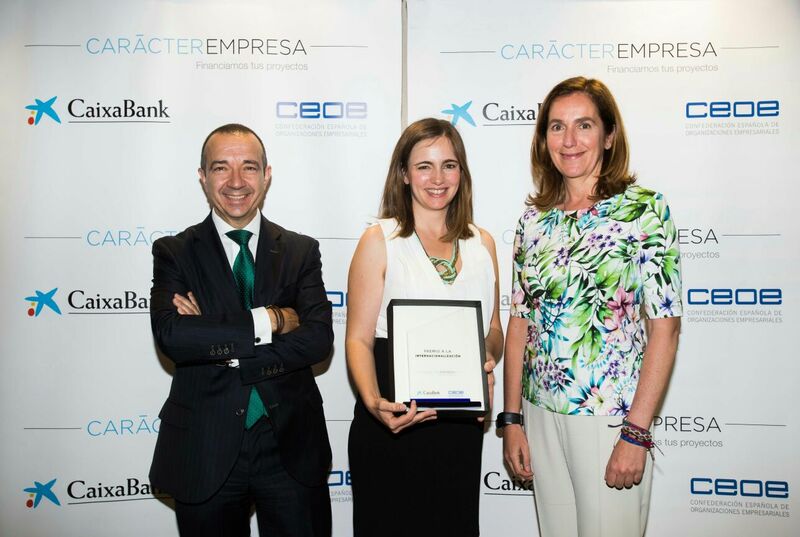 Libelium has been awarded with Carácter Empresa Award for its Internationalization granted by Caixabank and CEOE (Spanish Confederation of Business Organizations) to companies that stand out for its innovation and international activity. The aragonese company, that operates on Internet of Things and Smart Cities sectors, exports 90% of its production and celebrates this year its tenth anniversary. Alicia Asín, Libelium CEO, has received the award and noted that “it supposes a recognition to the impact that Libelium technology is generating worldwide with its smart solutions that improve people’s quality of life”. Caixabank and CEOE have valued for Libelium’s nomination its wide geographical location, the volume and solidity of international sales, positioning against competitors as well as the size and growth projection in overseas markets. Libelium has competed nationally with other 93 companies of its category. Over 2,000 clients from 115 countries in companies ranging from start-ups to large international corporations have adopted Libelium’s technology for projects in the five continents. Its solutions allows working in different sectors such as agriculture or smart cities deploying projects to optimize water quality and consumption, control environmental air quality parameters, waste management, traffic improvement by locating free parking spots or lighting management to save energy. Libelium exponential growth over the last five year has caused a year-on-year invoicing increase of 20%. The company has a staff of 73 employees, 30% more than 2015 and hopes to close this tax year with 6 million Euros.“Our expectation is to continue growing and opening new markets: that is why this year we are investing 1.8 million Euro”, affirmed Alicia Asín and David Gascón, partners and founders of the company.